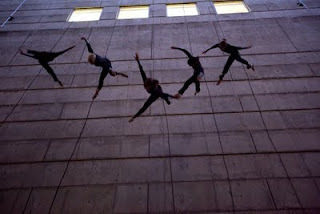 Choreographer Julia Taffe's newest creation celebrates the 10th anniversary of Aeriosa and the Scotiabank Dance Centre. The concept for Being was inspired by the question: will dance still take place in this location 10,000 years in the future? Not seeking to provide a definite answer, Being instead reminds us that the question must be asked first. Being is an integrated arts site work with breathtaking vertical dance commencing inside the Faris Theatre and ending by spilling over the top of the Dance Centre building. This experimental multimedia collaboration surrounds Aeriosa's signature dance style with with animation by Michael Mann, projection design by Tim Matheson, music by Jordan Nobles, costumes by Kate Burrows and lighting by Jason Dubois. Being features performances by dancers Julia Carr Lisa Gelley Meghan Goodman, Keely Sills, Cara Siu and Abby Watkins. 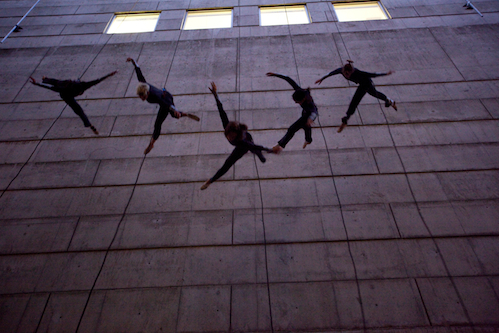 Aeriosa would like to thank the Dance Centre and all of our funding partners for making this unique project possible.